Though I've read lots online from Mach 1's enthusiasts as well as Forte enthusiasts, I'm wondering if anyone ever owned both at the same time and compared. They seem about equally price on craigslist. Looking forward to hearing some opinions. just my opinion simply no contest between the two loudspeakers. I have owned one of the Mach versions too long ago to remember which version heard a few others over the years I have owned both Forte and Forte ll (two sets of those). The Realistic were right up there with the white van speakers. Will only take you one listen to each to understand the disparity between the two speakers. I suppose some will disagree. Best regards Moray James. I went straight from owning Realistic Mach one speakers to owning Quartets and the clarity and detail of the Quartets is like comparing a Ferrari over a Yugo, there is none. The Mach ones are fine for a party, but forget it with critical listening. agreed. Mach one no comparison...I had them as well. I have owned both, not at the same time but really no comparison, I picked up the Mach Ones for 50 bucks, I got them home hooked them up and they hurt my ears so I sold them the next day to a friend at work for a garage system. I have no plans of ever getting rid of my Forte II's. Remember the Nova 8 from RS? Furniture grade cabinets with nice grills much like the Pioneer CS-99A. I have had both, the Mach ones are actually good, an aberration for RS! But the Fortes are in another class. If you are finding the Mach One speakers and Forte II speakers (priced and selling) for the same money, I suspect that with a little patience you will notice that the Mach One’s are most likely priced or selling on the extremely high side of the range and the Forte II speakers are priced or selling on the extremely low end of the range. 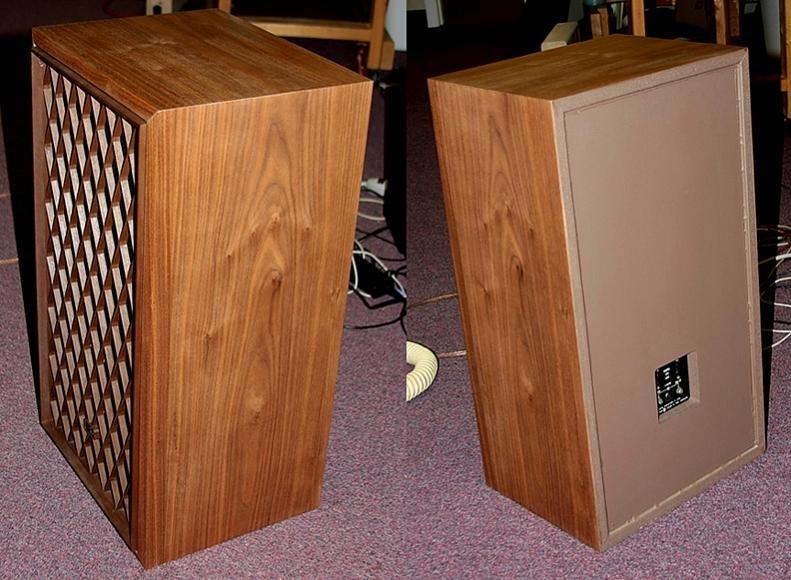 When I was tracking the Mach One speakers on eBay and various other avenues back in 2010, it was not uncommon to find good examples of the Mach One speakers selling for anywhere from $50 - $150 a pair. There was a thread on Audiokarma related to the Mach One speakers and when “videolady201” (had been designing speakers for a company for 25 years as a full time job) took notice and, for what I suspect to be “nostalgic” reasons, started evaluating and modifying the Mach One during the spring of 2010 on the long-running Audiokarma thread, the modifications piqued my interest and I found a pair of 4024 (note that the cabinet bottoms are veneered on the 4024 and only painted on the 4024A) that were substantially ‘mint condition’ with the original boxes for $200. Maybe the Audiokarma thread created additional demand and has driven prices up slightly; however, I’ve not seen a pair of Mach One’s sell in the $450 - $800 range that I see decent examples of the Forte II’s routinely sell for. Growing up, many in our neighborhood considered the Realistic Mach One to be the “poor man’s Klipsch.” I believe that the original Mach One's were debuted for the first time in December 1975. At the end of that first season (after staring in the window at the Radio Shack display every time I walked past the store), I was working 38 hours a week in the evenings after school and making $1.65 per hour as a 15 year old; I bought my first pair of Mach One's from Radio Shack for $200 for the PAIR, new in the boxes at the highly anticipated 2 for 1 sale they had every year! Although from different decades, the Mach One had a retail price of ~ $200 (and at the end of the season, Radio Shack would mark them down to a “buy one, get one free” deal) and I believe that the Klipsch Forte II retailed for ~ $550 each. Although there were mark-downs on Klipsch on occasion, I’ve never encountered a “buy one, get one free” deal for Klipsch. I haven’t been able to find a retail price for the original Forte speaker; however, I seem to remember that they may have even been priced higher than the Forte II. At the time that the Forte II's were selling new, the Chorus II was listing for ~ $900 each hence, the ‘poor man’s Klipsch tended to end up in our budget range as our choice as we wanted horns, but could not afford most horns. forte II's started out at 1400 a pair for wood veneer finish when I bought one of the first pairs made in 1989. Maybe that was with tax included. Black finish would have been slightly less. I don't think forte's were higher than the II's, and since the II's replaced the first edition, they weren't sold concurrently, at least after stock ran out. Agreed and I'm fairly certain that the Mach Ones' were designed more for the rock music and pop music of that day given that the bass notes seemed to have that 40Hz to 60Hz hump. I tried to draw the distinction of the time-difference in what I was discussing; however, I guess I failed. I could be incorrect on the pricing between the Forte and Forte II, but I seemed to have it stuck in my mind that the price came down somewhat on the Forte II. Sorry for the confusion, as I didn't think they were manufactured simultaneously. From the Klipsch site, the three-way Forte was first introduced in 1985 and manufactured by Klipsch until 1989. The three-way Forte II was first introduced in 1989 and manufactured by Klipsch until 1996. Agreed, huge differences and there is no comparison to the Forte or Forte II; however, given the connotation that "white van speakers" conjures up, I'm not sure about that analogy for the Mach One. 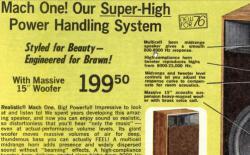 I believe that the internal drivers / components came from Foster Electronics in Japan and were competitive for mass-produced speakers during that era. In addition, the Mach One did have nice cabinet work and a woofer with a high compliance suspension system not very different from the ARs and other acoustic-suspension speakers of that era. However, as we all know, there "is no free lunch" and stuffing that 15 inch woofer in such a small enclosure essentially resulted in lower efficiency and the bass could not extend low either. No organ music for Mallette with the Mach One's. 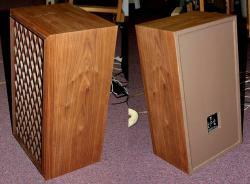 The other significant issue with the Mach One speakers was crossover related. Considering that they did not have the modeling software available to them that exists today (of course, that didn't stop PWK), essentially, the Mach One crossover is not even a three-way design. The mid horn is actually used similar to a two-way design and covers the mid frequencies and high frequencies. The bullet tweeter is there to try to help smooth out the frequency response; however, with the crossover design, the mid/tweeter would still receive bass down to 200Hz at 35dB down and the bullet tweet at ~ 600Hz or so, hence the blown tweeters you find on many of the used speakers. I bought a set of Nova 8B cabinets with blown drivers in the late 1970s because I liked the cabinets and replaced the drivers with a guitar 12 inch woofer and used a horn midrange and a horn tweeter set up similar to a Hersey. I had help with the crossover. Since I had not heard the original Nova 8B, I have no idea if my speaker sounded better or worse. I was able to pick a pair of Mach1's up at a garage sale for 10 bucks. They needed refoaming. I had never refoamed a set of speakers before, so if nothing else, I learned how to refoam from these speakers, which I will be eternally grateful. They did not sound bad, but like others have said, the Fortes are in another league. I sold them a couple months after I refoamed them.